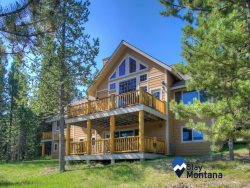 Stay Montana offers Montana vacation rentals located throughout Bozeman, Big Sky, Livingston-Paradise Valley, and West Yellowstone. Our accommodations offer an experience all their own, making it easy for guests to relax, unwind, and make memories. With a variety of luxury homes, modern studios, and pet-friendly rentals, you are sure to find the perfect fit for your next getaway! We love everything that Montana has to offer for adventure and exploration, which is why we have properties that make it easy for our guests to get outdoors and truly take advantage of the surrounding areas. Even our Downtown Bozeman vacation rentals offer easy access to hiking trails and amazing views of the nearby mountain ranges. Whether you spend the day fishing, mountain biking, or shopping, we want you to feel at home when they walk through the doors of your rental. Soak in the hot tub, sit around the fire, feast on a catered meal, or sit on the balcony and enjoy the expansive views. However you relax, Stay Montana has you covered; check out our concierge services too! Our dedicated staff are at your service to ensure a simple booking process and a delightful stay. Check out our list of Montana vacation rentals below and please feel free to contact us with any questions. Fly Fishing House with Private Hot Tub! Smart and Sassy on Main Street! Fisherman's Flat on Main Street! Fish Tales on Main Street! Quintessentially Classic on Main Street! Let the Sun Shine on Main Street! Historic Overlook on Main Street! Bozeman Getaway with Great Location! Gracious Urban Abode on Main Street! Beautiful Home in Downtown West Yellowstone! Incredible mountain views and great location to Big Sky Ski Resort!